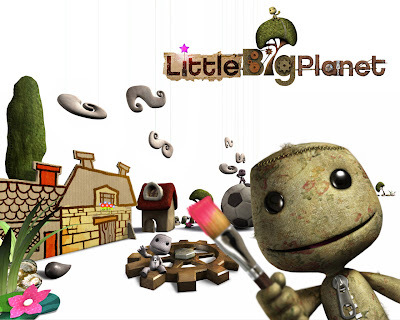 Media Molecule's Mark Healy already revealed possible plans for a PSP port of their upcoming hit, LittleBigPlanet! Which spells greatness in bold letters! The idea of using the PSP as some sort of extension to the already great PS3 has been floating around lately! Also, with Sony's recent talk about possible PSP MMOs! "It'd be great to make, for the people who are really into the Create side, some kind of companion products that allow you to create things while you're on the train," he said. "One thing that I'd love to add is the ability to create you're own music, for example, that you can import into the game. That seems like an obvious one to do and it'd be quite easy really." That's a logical use of the PSP! Hold on now, I'm not saying the PSP isn't great as is, but this addition can't really hurt! Besides, this could really boost PS3 & PSP sales! A couple of these innovative use of the PSP, and Sony is set for this generation's battle! Recently, Sony of Japan, issued a press release listing all PS3 and PSP games that will be shown at this year's TGS. Don't get your hopes up just yet! because Sony also stated that amongst the games that will make their way to TGS, 14 are new titles that we've never heard of before! Never is the keyword here! What does this mean? 12 in total, had never been heard of before?! Sony's been busy, I see! Don't forget that those don't include already announced games ( Resistance 2, anyone? ) but totally new IPs! Maybe now we could get some light shed on the ICO team's new game! Also, Konami has one game. Could that be MGS5?! But it would be rather too soon for it. Hmm, we'll get to see the full listing of the games once TGS begins, which is in a week ( from October 9 to 12 ). Here's a new footage of Killzone 2. It shows the game's interface of what seems like the multiplayer aspect of the game. It starts by showing a screen where you can setup some basic options before the match, then followed by the spawn area overview map. A guy is seen running through an empty map (possibly taken from in-game beta testing) shooting and jumping. Not much can be seen though, the quality isn't that high. But if you're eager to see anything from this game, then this might be just what you needed! Sony Online Entertainment president John Smedley has revealed to MTV Multiplayer that the company is considering massively multiplayer online games for the PSP. Hear that everyone? Does that mean there will actually be a use for our beloved-stashed-away PSPs? I gotta say, MMOs on PSPs... It's about time! how did they come up with that?! You gotta love their sense of accomplishment, everyone! Continue reading what Tracy John has to say about this in this link. PS: I'm sorry I've been away for quite sometime now, but I was quite busy with my game programming learning! I gotta say, it's quite tough to program games, specially when most books give faulty codes!